Zelda II: The Adventure of Link is an action-adventure game developed and published by Nintendo for the NES, and the second installment in The Legend of Zelda series. It was originally released in Japan on the Famicom Disk System less than a year after the release of the original Legend of Zelda. Nintendo released Zelda II in Japan on January 14, 1987, seven months before the United States saw the release of the first Zelda title. It was the second best selling Famicom game released in 1987, selling approximately 1,610,000 copies in its lifetime (roughly two thirds as many sales as Dragon Warrior II). 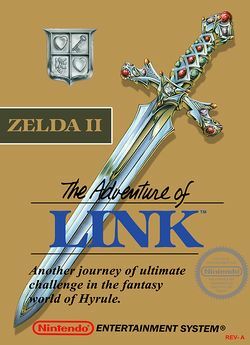 Nintendo released Zelda II in North America in 1988, two years after its initial release in Japan, converting the game from its initial Famicom Disk System format to the NES cartridge. The Adventure of Link is a direct sequel to the original The Legend of Zelda, and again involves the protagonist Link on a quest to save Princess Zelda, who has fallen under a sleeping spell. The Adventure of Link's emphasis on side-scrolling and RPG-style elements was a significant departure from its predecessor, and has given it a reputation as the "black sheep" of the Zelda series. 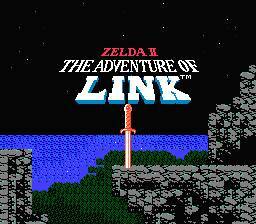 Despite never being as popular as its predecessor, it was still one of the most successful NES games of all time and introduced elements that would become commonplace in future Zelda games. In its time it was voted "Best Overall Game" in the Nintendo Power Awards '88, was ranked in Nintendo Power's Top 5 games from their January/February 1989 through July/August 1990 issues, and stayed consistently in their Top 30 (later Top 20) NES Titles from the game's introduction in the September/October 1988 issue until the NES Top 20 was phased out in January 1995. It was followed in 1992 by The Legend of Zelda: A Link to the Past for the SNES. The Adventure of Link bears little resemblance to the first game in the series. The Adventure of Link features side-scrolling areas within a larger world map rather than the top-down view of the previous title. The game incorporates a strategic combat system and more RPG elements, including an experience points (EXP) system, magic spells, and more interaction with non-player characters (NPCs). Link has extra lives; no other game in the series includes this feature. Shortly after the events of The Legend of Zelda, Link notices a strange mark on the back of his left hand, similar to that of the crest of Hyrule. He seeks out Impa, who responds by taking Link to a door in the North Castle; this door has not opened for generations. Impa places Link's left hand on the door, and it opens, revealing a sleeping maiden. Impa tells Link that the maiden is Zelda, the princess of Hyrule from long ago, and the origin of the "Legend of Zelda." Zelda's brother had tried to force her into telling their recently deceased father's secrets, where he had hidden the last of three sacred golden triangle treasures of his kingdom, known collectively as the Triforce. Princess Zelda refused to reveal its location; the prince's wizard friend, in anger, tried to strike her down with a spell. This resulted in a powerful sleeping spell, but also resulted in his own death. The prince, unable to reverse the spell, had his sister placed in the castle tower, in the hope that she would one day be awakened. He decreed that females born to the royal family from that point on would be named Zelda, in remembrance of this tragedy. Impa says that the mark on Link's hand means that he is the chosen hero to awaken Zelda. She gives Link a chest containing six crystals and ancient writings indicating that each crystal needs to be placed in a different palace in Hyrule. This will open the way to the Great Palace, which contains the Triforce of Courage. This, combined with the other two parts, has the power to awaken the enchanted Zelda. Taking the crystals, Link sets out to restore them to their palaces. Meanwhile, the followers of Ganon are seeking to kill Link—sprinkling his blood on Ganon’s ashes would bring Ganon back to life. This page was last edited on 20 September 2018, at 02:20. This page has been accessed 183,896 times.